Mini rant: who are these people? Who are these vile, disgusting people? Who are these charlatans whose job it is to intentionally mislead and entrap? Who are these conjurers of clicks? 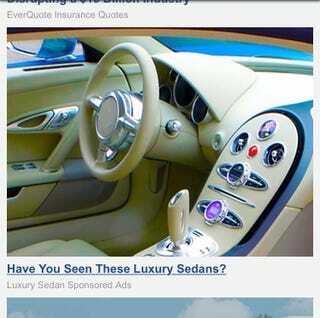 First, that is not an image of the interior of a so-called sedan. That recognizable cockpit belongs to the mighty Bugatti Veyron - a vehicle known to contain only TWO SEATS. And second, why Photoshop out the Bugatti emblem from the steering wheel center? Why, why, WHY?! ?